The major drainage of WRIA 57 is the Spokane River. The Post Falls Dam, located nine miles downstream from the outlet of Lake Coeur dâ€™Alene regulates flow in the Spokane River about half the year. Several run-of-the-river dams along the mainstem have minor effects on the Spokane River hydrograph. There is a high degree of hydraulic continuity between the Spokane River and groundwater of the SVRP Aquifer that strongly affects seasonal and annual flows. Between the Idaho-Washington border and the riverâ€™s confluence with Hangman Creek, there are several defined gaining or losing reaches. The SVRP Aquifer and its overlying soils are permeable to the extent that streams running off of the adjacent uplands completely infiltrate into the sub-surface at the margins of the aquifer. 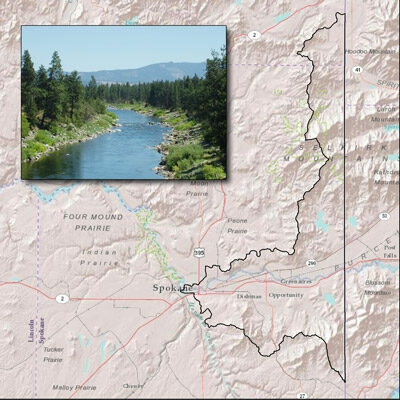 As a result, there are no perennial tributaries to the Spokane River in WRIA 57 between the state line and Latah (Hangman) Creek, west of downtown Spokane.